The pichwai form is getting a revival of sorts, with art collectors across the world sourcing the hand-painted fabric or paper for their homes. 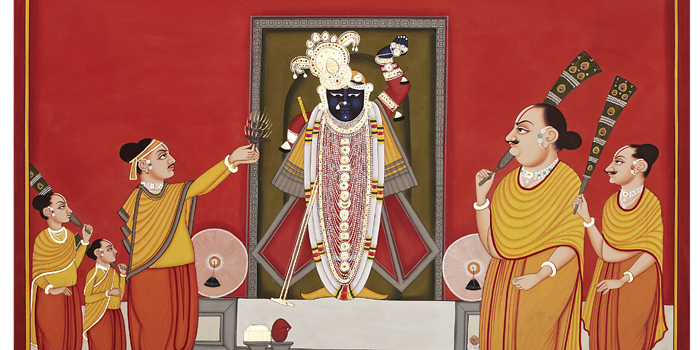 The tradition of depicting scenes of temple worship originated at a temple in Nathdwara, near Udaipur, as a means to decorate the resident Shri Nathji orA� Lord Krishna idol. In the 17th century, only five families of the Vallabhaichari sect created the carefully composed renderings of Lord Krishna. Today, online platforms like Jaypore showcase pichwais in unusual formats, sourced from artisans and independent producers. A recent feature had hand-painted mixed media art on canvas by an art studio based within the Kishangarh Fort near Ajmer. They have also showcased Sonya Saprua��s digital prints of old pichwais. Currently, a sale from Ruh has been put together by art and fashion expert, Pooja Singhal. Hailing from an industrialist family in Udaipur, Singhal has grown up with pichwais, and her efforts to revive the traditional format is laudable. If you want a closer look and a more extensive selection, youa��re in luck. The serene setting of Amethyst on Whites Road has been chosen to showcase a special line by Singhal, from Monday. She is bringing down close to 90 pichwais in varied sizes. a�?a�?There are smaller ones for flats and signature pieces that have been commissioned for farmhouses in Delhi,a��a�� she explains. Many pichwais are linked to festivals and seasons. Some come with detailed borders, but Singhal has a few pieces in monochromatic colour schemes that a�?a�?suit modern interiors.a��a�� She has extensively researched the tradition, sourcing old catalogues for rare scenes. The use of stone colours as opposed to pigments has been revived. We expect a crush for the pichwais, so get there early. from `10,290 to `2.5 lakh.